Here's an issue that took some extra Google-Fu in order to get straightened out. Apparently there is a bug with some HP printer drivers that will make it give you an error that "The '(Name of Driver)' printer driver is not installed on this computer. 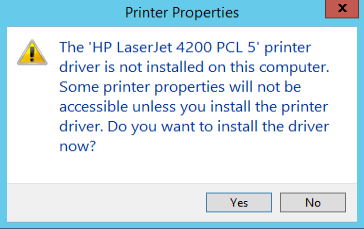 Some printer properties will not be accessible unless you install the printer driver. Do you want to install the driver now?" Luckily, this one can be fixed by a registry hack. 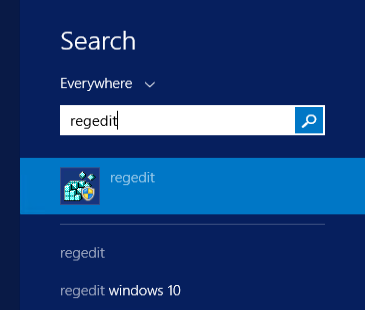 Just make sure you're careful screwing around in the registry and you always create a backup every time unless you like to live dangerously like I do. Click start, type 'Regedit' and then hit Ctrl-Shift-Enter to open it as an Administrator. Maybe you can just hit Enter too because I think it has to run as admin by default. I've gotten so used to that little key trick to always make sure I'm opening as an administrator. 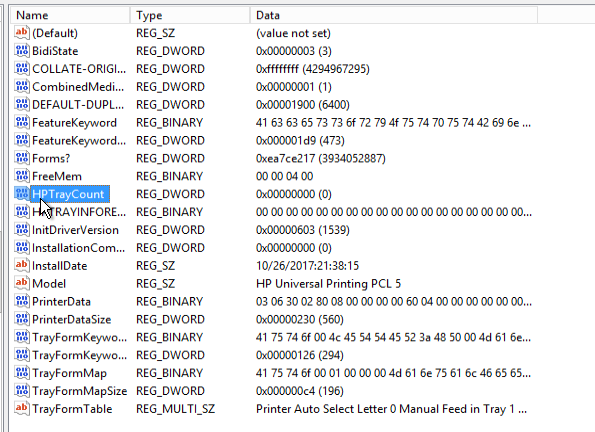 Change HP Tray count to Decimal Value 18 instead of Hexadecimal Value 0. I don't remember where I found this but one other contributor said they changed it to Hexadecimal value 5 and that worked too. Hopefully that does it for you!